Superstition is a powerful force, and people will go to great lengths to gain good luck and avoid bad luck. If you break a mirror, you'll get seven years of bad luck, but if you rub Buddha's belly you can get some good luck. Walking under a ladder is bad luck, but knocking on wood can help counteract it. Then there is the proverbial black cat. For Spider-Man, meeting the Black Cat meant he eventually got lucky, though ultimately that luck turned bad. Felecia Hardy is the woman behind the Black Cat, and she followed her father into the infamous trade of cat burglary. She started out as simply a gifted athlete and honed her body with rigorous training and the martial arts. She would meticulously plan out her criminal capers to make it look like she actually caused bad luck while robbing someone. She did her work so well that even super heroes were fooled into thinking she had powers that caused this bad luck. Committing crimes in New York usually gets the attention of the NYPD and the friendly neighborhood Spider-Man. Some of this attention is reciprocated, and the Black Cat finds herself strongly attracted to Spider-Man. There are obvious reasons that the attraction is returned and they hook up for a while with the Cat even doing a few good deeds. When Spidey found out she didn't actually have any super powers (besides part of her defying gravity) and she got injured fighting Doctor Octopus, he broke off their relationship. Like many women, she wasn't ready to move on so she found a way to actually get super powers. However, she got the powers from the Kingpin and when you work with him there is always a price, and it isn't four payments of $9.99. Not only that, but the powers she was granted caused bad luck, and they were growing and becoming dangerous to both Spider-man and the Black Cat. So they went to see the doctor, Doctor Strange, and he was able to remove her powers completely, though she didn't know they were totally gone at the time. Hell hath no fury like a woman scorned, and after being dumped by Spidey and losing her powers, she held a grudge. It only got worse when Spidey married Mary Jane, so Felicia did the next best thing and started hanging out with Flash Thompson. She eventually started to fall in love with Flash, and was able to bring her relationship with Spider-Man to friendly ground. At least for now. This particular incarnation of the Black Cat is based on the recent mini-series Spider-Man and the Black Cat - The Evil That Men Do. The mini-series was published in late 2002 and was written by Kevin Smith, known more for his bawdy movies than his comics work. 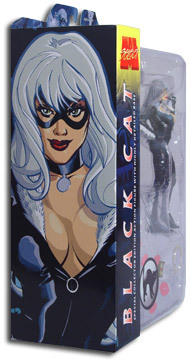 The bodacious Black Cat was drawn by Terry and Rachel Dodson, so you can blame them for any impure thoughts that may have been inspired by Felicia's appearance. The best description of the Black Cat figure would be that she's sculpted to be anatomically improbable. She's lithe and voluptuous, with measurements that will lead to a chiropractor. Her pose looks relatively innocent with her black jumpsuit (that is at least two sizes too small) unzipped to reveal part of her hourglass figure. Better make that an hour and a half. Her breasts are actually made of a softer plastic than the body, so they are slightly squishy while still being firm. This determination was made after rigorous testing, though she did lose the 'Pepsi Challenge' with a pair of the real things. The figure is sculpted with enough detail to see the curves, leather creases in the costume and even the outline of toes on the feet. Other details are left to your imagination. Once you get beyond the cavernous cleavage (and it might take a while) she does have other features. One is a long and lustrous mane of platinum hair (made of softer plastic) that frames her blue eyes and cascades down her back. Her measurements work out to 37-26-35, and that's quite respectable. She stands 6.5 inches tall and she has ball-jointed shoulders, mid-bicep and wrist twists. She has a waist and a ball-jointed neck (the neck movement is limited due to the hair) and the thighs twist at a v-crotch to maintain the sculpting for her posterior. Surprisingly, even though she looks top heavy she is very stable standing up. The hair counterbalances her other assets so she doesn't take a tumble. 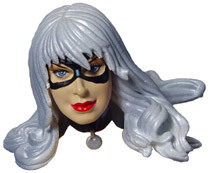 The sensual Black Cat has been sculpted by Steve Kiwus, and this far he has done all the women for Marvel Select. Besides Elektra and the Black Widow, he sculpted the Punisher and the upcoming Ultimate Iron Man. Steve has also sculpted figures for Toy Biz, McFarlane Toys and the upcoming Unreal figures from Radioactive Clown. Marvel Select is a line of figures from Diamond Select and Toy Biz for the direct market. The line is based around a seven-inch scale (a character six feet tall would be seven inches in scale) and they all feature highly detailed display bases to go with the figures. They are all packaged on large blister cards with a big spine with artwork, so they can be displayed on a shelf like books. They can also be displayed on shelves like toys, once they are removed from the package, and some of the bases are wall-mountable. The line is planned to run for 36 figures, and with the Black Cat's release on May 14th, 2003 the line will be at seven. The characters for Marvel Select have been chosen to take advantage of the direct market, and this opens possibilities the mass market might overlook. This includes more female characters (there are now three in Marvel Select) or other characters that couldn't support a full line or would otherwise not make it into the mass market. The line kicked off with the Ultimate Spider-Man, followed by the Punisher, Elektra, the Ultimate WW2 Captain America, Black Widow 2 and Wolverine from Origin. The next three figures are a trio of Ultimate ones, with Iron Man, the Hulk and then Venom.